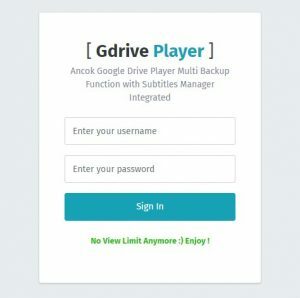 Play video Google Drive Url on your website with Ancok Player New Google Drive Bypass Limit View With Multi Backup 5 urls Google Drive cPanel Admin. Fully Encrypted Output Link Streaming. Whatever the current status of this product is we don’t provide refunds and guarantee updates. Please read our Terms & Conditions first and if you have any questions please contact us before placing an order. Ancok Player New Google Drive Bypass Limit View With Multi Backup helps you to stream video files stored on Google Drive in a fully customizable way, you will have full control over the player. The HD option is Fake!, if you find the HD Options in this player that are just fake HD Options, thanks. When the fifth google drive url get an error then it will load Sweet Alert Notificaton function! If 1, 2, 3, 4, 5 get an error the visitor still able to watch the movie by clicking button options on your player.